We need a fixed current around 20mA for a voltage variation of 10V to 20V to drive a LED flasher circuit. The transistor should handle 20V * 2 = 40V and a current of 20mA * 5 = 100mA. We have to overrate the components for long term reliability and make the design rugged. Chosen MPSA92 PNP-300V-500mA which is good for this job. Look at the pin details of MPSA92 in the bottom view given in the right of this page in its TO-92 package, it has a beta of 25 . The Power dissipation of MPSA92 can be upto 650mW , our requirement may be a max of 20V*20mA = 400mW which is just within limits. Now we need a voltage reference a low cost voltage reference is a LED which has a 1.6V forward drop. As the circuit is a not an accurate one CFR 5% resistors are fine. The LED at 40mW will last long, some energy emits as heat and some as light. 40mW / 1.6V = 25mA. so let us choose 20mA max LED current as a thumb rule. 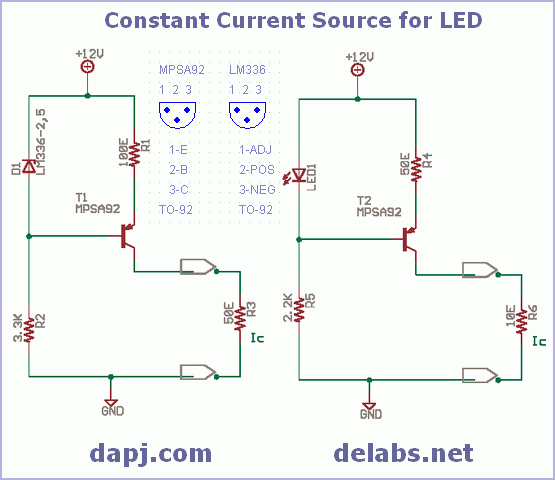 In this circuit the LED is used as a reference so to keep it cool a 2.2K is chosen. (20V - 1.6V) / 2.2K = 8.3mA on the high side and when voltage is 10V the current will be 3.8mA min. .
Look at the circuit in the right, the LED has a forward drop of 1.6V which is applied across the resistor R4 and the base-emitter diode. That means 1V across R4 as a diode drop is around 0.6V. The base-emiter now gets forward biased and a small base current Ib flows . The Ic or collector current is 1V / 50E = 20mA. The Ib = Ic / beta, That means 20mA / 25 = 0.8mA which flows thru R4 and R5. The Load Resistor R6 represents the LED flasher circuit that consumes 20mA, even on short circuit of R6 the current is limited to 20mA. When more current flows in R6 the voltage at emitter falls, the voltage at base is 20V - 1.6V =18.4V, and the voltage at emitter should be 18.4 + 0.6V = 19V for bias and Ib to flow. When Ic increases the Ib reduces to that extent as only to maintain emitter voltage at 19V, this way Ic is kept constant, if Ic reduces the voltage at emitter builds up to rise Ib which in turn builds up Ic. so we made a current regulator. The circuit on the right will be more stable, but still the forward drop on base-emitter junction is temperature sensitive. The base current will also introduce an error, so you can get a 8 bit stability, that means around 255 counts on an A-D converter. If you need a more stable current source you should design with FET and opamps. LM336-2.5 pdf details, It has a 2.5V drop. A LM336-5.0 pdf version is also available for 5V. these are from National Semiconductor. "If all parts are working, connected in proper polarities and there are no dry solders and loose connections then any circuit well designed ought to work."